In 1982, Shin Dong-hyuk was born in the North Korean political prison camp infamously known as Camp 14. Today, Shin, now a free man, tells his shocking and sometimes graphic life story to audiences around the world. Having witnessed the executions of his mother and brother as a young boy, Shin remains one of the strongest voices in the effort to raise awareness of the human rights abuse in North Korea. Seven years after Shin’s escape from the Kaechon internment camp, American journalist Blaine Harden published “Escape from Camp 14,” an official biography of Shin Dong-hyuk and a daunting read for even the most strong-willed bibliophiles. The novel starts off with Shin’s earliest memory: an execution. Shin was only 4 years old when he was first exposed to the gruesome horrors of Camp 14. Ten years later, he informed the guards of the escape plan of his mother and brother, whose executions he was forced to witness. Because this was the cold, twisted reality in which he grew up, 14-year-old Shin believed he had done the right thing. He even felt betrayed by his mother and brother, who desired to escape from the only world that he had ever known, a world abound with draconian laws and a severe lack of humanity. Nevertheless, guards attempted to extract information from Shin regarding the planned escape by torturing him over a coal fire. Beatings and torture became commonplace in Shin’s life. As a child, he witnessed a 6-year-old classmate get beaten to death with a chalkboard pointer. Malnourished and hungry, young Shin often scavenged around the camp for food, resorting to eating rats and insects. As a young man, he had his right middle finger cut off at the first knuckle as punishment for accidentally breaking a sewing machine. Shin’s chilling tale evokes the tragedy and horror of the Holocaust, but for young Shin, Camp 14 was his home, a place where a life devoid of happiness and comfort was only natural. He had no knowledge of the outside world and therefore had no hope to lose. Shin had never mustered up the desire to escape until he met Park, an educated and well-traveled man who shared mystifying tales of the outside world. It was then that Shin made his clumsy escape in a series of grisly events which officially marked the end of his days in the wretched prison camp that had made his life a living hell. 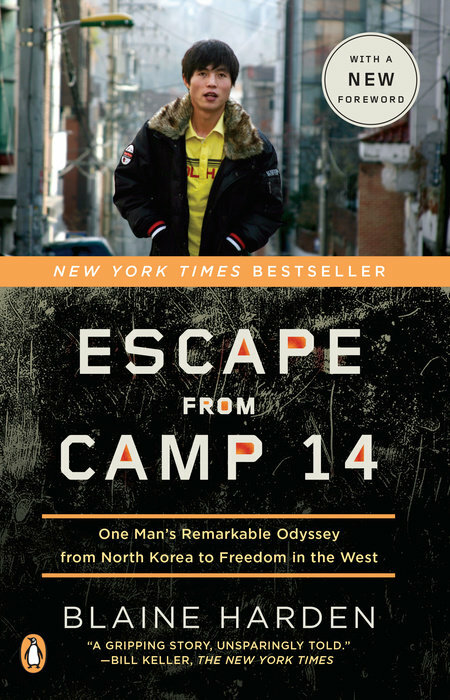 “Escape from Camp 14” can be bought from Penguin Random House online.